Monflo allows you to transfer files between Server and Client devices with applications installed on two PC computers. Learn how to do it. To transfer files between two PC computers you have to right-click on a file and choose Send with Monflo option. To transfer a file from your Client computer to Server computer you have to right-click on the file you intend to send and choose Monflo: send to [server computer name]. 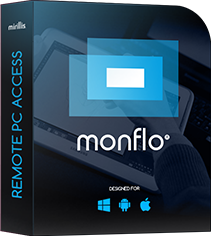 Install the latest Monflo Client app on the PC which you will use to control Server PC. File transfer feature have a series of options to set up for you to get the quality you need. Maximum upload and download speed and choosing a target file folder.